Well here I am with this awsome stamp by Lavinia Stamp. Sebastian the seahorse and isn't he just gorgeous. I wanted to use up an acrylic stack that I've had forever so thought I would give it a go with this stamp. Great fun to create but you just need to plan carefully what's to be stamped where in order to build up the stack and depth of dimension. I have to say that the picture really doesn't show all the sparkle and dimension and it really does look amazing in real life. I started with what was to be my top piece of acrylic and stamped Sebastian with black stazon. Then take the metallic paint and paint it over the image, adding a touch of Zinober Gold over the eye. Once dry, colour over the metallic paint with the gold posca pen. Set aside to dry. Take the base of the acrylic stack and pale blue paper and glue over the base with gel medium. Set aside to dry. Take the next piece up, I chose the thick piece for this and stamp the large open circles from the ripple effect and the fish from the summer at the beach set in black stazon. Stamp the seaweed from the summer at the beach set with fern green archival. Use the white posca pen to add highlights to the circles and starlight paint to the fish. Add some clear glue to the circles and sprinkle on the halo mix. Set aside to dry. Take the third piece of acrylic and stamp the sand and sea shells from summer at the beach with black stazon and the small fish from dare to swim set in olive green stazon. 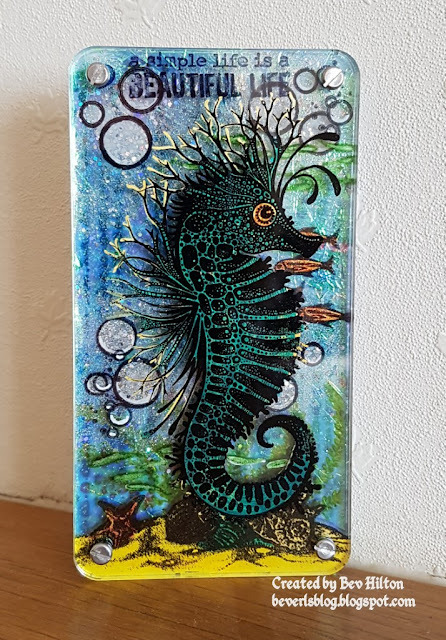 Colour sand and shells with the posca pens and add some silver to the back of the fish with a silver posca pen. Set aside to dry. Go back to the base piece now dry and stamp the rain droplets in Pacific Point. Take the gel medium and cover thinly and apply the holographic foil, pressing down flat. Set aside to dry. 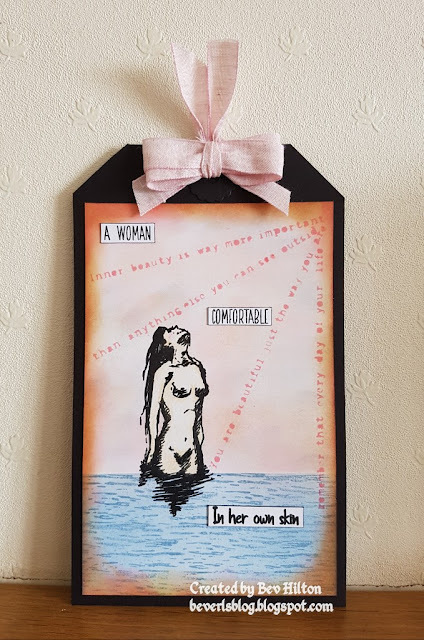 Now that the third piece is dry, turn over and stamp the wording from old mac and stamp with black stazon at the top of the acrylic piece. Take the screws and bolts that come with the stack and screw all four pieces together. As I said above, the pictures really don't show the sparkle and dimension but I hope you like it. All for now. 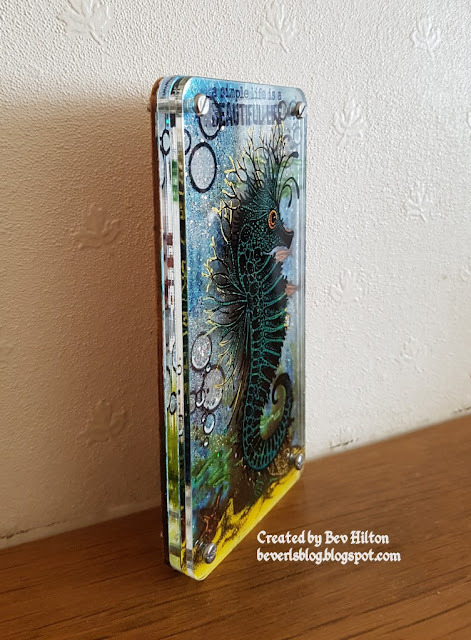 This is truly amazing Bev, I adore that seahorse and its sweet face. The acrylic layers really look 3D, great side view showing just how much detail has gone into this. Thank you for sharing and sorry I didn’t see it earlier, blogger seems to only show me posts it wants me to see!! So glad I searched for it... fabulous!